Larodan will be exhibiting at the Life Science Exhibits vendor show at UCSF Mission Bay on April 25, 2019. The show will take place at the Fisher Ballroom of the Mission Bay Conference Center from 11:00am to 1:30pm. Larodan sponsors and exhibits at the AOCS (American Oil and Chemists’ Society) 2019 annual meeting in St. Louis, Missouri on May 5-8, the expo will be held at America’s Center Convention Center. Please visit us in our booth, number is #328. 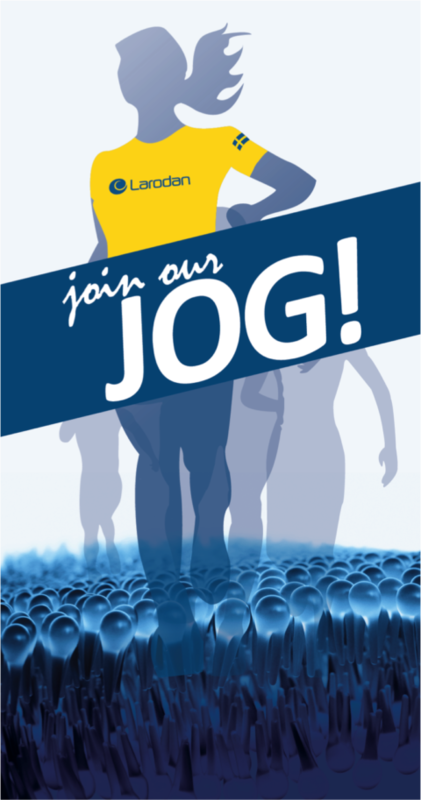 We will also sponsor a 5k run during the event! The AOCS Annual Meeting & Expo is a premier international science and business form on fats, oils proteins, surfactants and related materials. Known for its extensive technical program, the Annual Meeting features more than 650 oral and poster presentations within 12 interest areas. In addition to the three days of technical sessions, Annual Meeting features an Opening Plenary and Celebration, Hot Topic Symposia, Expo, Business Meeting, and a variety of networking events, including a 5K Fun Run/Walk and Member Appreciation Luncheon. The Annual Meeting provides ample opportunities for attendees to learn, reconnect with colleagues, engage with new business contacts and meet with exhibitors. Over 1,500 professionals from more than 40 countries attend the Annual Meeting, representing the industry’s most prestigious corporate, government and academic institutions. Larodan will be sponsoring the DGF (Deutsche Gesellschaft für Fettwissenschaft) conference on membrane lipids, taking place from May 9-10, 2019 in Berlin, Germany. The aim of this conference is to bring togather scientists and students from all over the world who are interested in biochemistry, biophysics, molecular biology and cell biology of membrane lipids research. Read more about the conference here. Larodan will be sponsoring the DGF (Deutsche Gesellschaft für Fettwissenschaft) symposium, taking place May 21-22, 2019 in Berlin Germany. The aim of the 2nd symposium is to give an up-date on the status and knowledge of all aspects of MCPD esters and glycidyl esters in oils and food. More than ten years after the first findings of 3-MCPD esters in vegetable fats & oils, qualified experts will discuss relevant aspects of formation and mitigation during oil and food processing, new developments in analytics and the toxicological assessment of the esters and approaches taken for their regulation. Read more about the symposium here. Larodan will be exhibiting at and sponsoring this year’s BSC Meeting, which will take place at the University of Toronto Mississauga (UTM). The University of Toronto, Canada’s largest university, is composed of three campuses with the Mississauga campus (UTM) situated just west of the downtown Toronto core on 225 acres of protected greenbelt. The 2019 meeting will commence with an opening reception on May 28th, and run for three full days through the 31st. The symposium will consist of a series of professionalism and skills development training sessions, as well as provide a venue for trainees to share their research accomplishments and network with their peers. Larodan will be exhibiting at the 2019 ASMS conference from July 2- 6 at the Georgia World Congress Center in Atlanta, GA. The American Society for Mass Spectrometry (ASMS) was formed in 1969 to promote and disseminate knowledge of mass spectrometry and allied topics. Membership includes over 8,500 scientists involved in research and development. Members come from academic, industrial and governmental laboratories. Their interests include advancement of techniques and instrumentation in mass spectrometry, as well as fundamental research in chemistry, geology, forensics, biological sciences and physics. ASMS sponsors the Annual Conference on Mass Spectrometry and Allied Topics that is attended by more than 6,500 scientists. Approximately 3,000 papers are presented as posters and talks. Come see us at our booth! Larodan will sponsor, exhibit and jog at the Nordic Lipid Forum Symposium, taking place on June 12-15, 2019 in Horsens, Denmark. In 2019, the Nordic Lipidforum Symposium celebrates its 30th anniversary. The symposium is an important forum for researchers, scientists, engineers and others working in both academia and industry to exchange scientific and technological results in the area of lipids, fats and oils. The topics of the symposium will encompass: marine lipids, analysis, skin care, industrial aspects of lipids, health and nutritional aspects and food safety and regulatory affairs. Larodan will be sponsoring and exhibit at the 60th International Conference on the Bioscience of Lipids, taking place June 17-21, 2019 in Tokyo, Japan. ICBL is a conference format designed for scientists with common interests in lipid research. It was founded more than 65 years ago and is a prominent forum for the exchange of ideas, communication of novel developments and discussion of a broad variety of aspects related to lipid bioscience. ICBL attracts colleagues from all continents to the frontiers of lipid research presented and discussed during the conferences. Another major aim of ICBL is supporting research of young scientist, giving them the opportunity to meet renowned scientists, and thus providing the scientific inspiration for future careers in lipid research. Larodan will be sponsoring the European Symposium on Plant Lipids, taking place on July 7-10, 2019 in Marseille, France. The European Symposium on Plant Lipids (ESPL) is an international conference, showcasing the key roles of lipids in plant/algal development, physiology and biotechnology applications. It is the best and most renown European conference dedicated to the study and biotechnological applications of lipids, already having almost 20 years of history. The 9th ESPL conference will be held in Marseille, France and will provide an excellent opportunity to illuminate the very best of current advances in the field of plant and algal lipids. ESPL has the long tradition of gathering world leading plant/algal lipid scientists to share and discuss the latest results in the areas of lipid research and to point future directions. Up to now, the ESPL congresses, from very fundamental aspects towards the biotechnological applications of lipid molecules, have brought together more than 120 top leading scientists from all around the world every two years. This has helped to build a global network of scientists in the field. Larodan will be sponsoring and exhibit at the the joint 12th EBSA and 10th ICBP-IUPAP Congress, taking place July 20-24, 2019 in Madrid, Spain. Larodan will be attending the Gordon Research Seminar on Lipid Remodeling: From Molecular Mechanisms to Biological Functions on July 27-28 in Waterville Valley, NH. This Gordon Research Seminar is a unique forum for graduate students, post-docs, and other scientists with comparable levels of experience and education to present and exchange new data and cutting-edge ideas. This seminar will precede and complement the Gordon Research Conference by stimulating discussion amongst early career lipid researchers on the mechanisms, functions, and regulation of lipid remodeling in normal physiology and pathological conditions. In addition to a scientific program encompassing the most groundbreaking aspects of lipid biology, this seminar will feature a career mentorship panel comprised of both junior investigators and established leaders in the field. The meeting will be conducted in an informal setting and provides a unique opportunity for participants to present unpublished data, exchange ideas and network with like-minded peers. Please reach out if you plan on attending – we would love to see you there! Larodan will be attending the Gordon Research Conference on Spatiotemporal Regulation of the Lipidome from July 28 to August 2, 2019 in Waterville Valley, NH. The 2019 Molecular and Cellular Biology of Lipids Gordon Research Conference and Seminar will provide a forum for scientists to present and discuss their most recent discoveries in lipid biology and metabolism. A focus on the “Spatiotemporal Regulation of the Lipidome” reflects the remarkable complexity and vibrant plasticity of lipid molecules within living systems. Membranes and their lipid components are constantly remodeled at specific locations within cells during normal metabolism and in response to changes in their environment. Many signaling events are mediated by lipid molecules or their metabolites. Organismal energy needs are in constant flux and meeting these needs depends on changes in lipid metabolism at the cellular level and across multiple organ systems. Leading causes of death worldwide, including heart disease, diabetes, and cancer, have strong lipid components to their pathologies. Topics emphasized in the nine plenary sessions of this meeting include signal transduction through sphingolipids and phosphoinositides, the dynamic distribution of lipids within and between various membranes or lipid droplets, the impact of lipids on membrane properties, metabolism of fatty acids and sterols at the cellular and organismal level, lipid links to energy metabolism, and the involvement of lipids in disease processes. An outstanding group of invited speakers will anchor the plenary sessions, and 14 of the 36 talks will be chosen from the submitted abstracts to capture the most recent cutting-edge science. Poster sessions each day provide a great setting for discussion and feedback on emerging discoveries for all attendees. This conference seeks to attract scientists from across all subdisciplines of lipid research to provide a synergistic cross-fertilization of ideas and concepts. In addition, the beautiful setting within the White Mountain National Forest and abundant opportunities for outdoor activities provide an enjoyable environment for informal discussions. These interactions should accelerate the pace of groundbreaking discoveries in an area of science with tremendous impact on human health. Please reach out to us if you plan on attending – we would love to see you there! Larodan will be attending the 2019 Kern Lipid Conference, taking place August 12-14 in Vail, Colorado. Please reach out to us if you plan on attending as we would love to see you there! Larodan will be exhibiting at the 2019 NIH Fall Research Festival. The event takes place on September 11-13, 2019 at the NIH Building 10 parking lot in Bethesda, MD. Please stop by our table in the Exhibit tent on Thursday and Friday to meet and discuss what we can do for your research with Larodan’s research grade lipids! Larodan will be exhibiting at the 16th international conference on Bioactive Lipids in Cancer, Inflammation and Related Diseases, which will take place October 20-23, 2019 in St. Petersburg, Florida. The goal of this 30 year meeting series is to promote the exchange of existing knowledge from around the world, foster new research ventures and interdisciplinary approaches and provide a forum for the dissemination of the latest scientific information on bioactive lipids in health and disease as it relates to cancer, inflammation, and inflammation associated diseases such as cardiovascular, diabetes, hypertension, psoriasis, Alzheimer’s, neurological function, dermatological conditions, etc. Larodan will sponsor, exhibit and jog at the Euro Fed Lipid Congress 2019, taking place on October 20-23, 2019 in Seville, Spain. Euro Fed Lipid is a federation of 13 scientific associations concerned with Lipids, Fats and Oils. The federation represents 2000 individuals and companies. Its mission is the furthering of lipid science and technology and the cooperation and exchange of ideas between scientists and technologists at a European level.